If you like kicking back in unpretentious, comfortable, friendly village pubs that serve locally sourced, home cooked food – and who doesn’t? 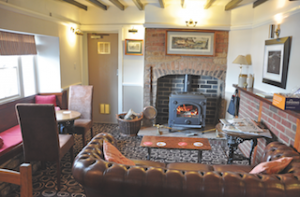 – then you should try the Black Bull at Market Overton. 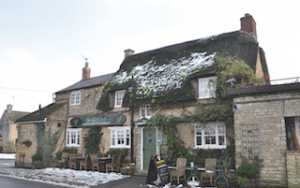 A thatched, cosy 17th century building where the woodburner is always aglow on cold days and the beams in the bar are low enough to make six-footers duck or grouse, it does what all good pubs should do – provide a cosseting space where you can escape from the world. Run by Kevin and Kristy Housley since 2008 and situated next to Market Overton’s fantastic community shop – “there’s a great community spirit in the village,” says Kristy – the couple have an impressive local sourcing policy. 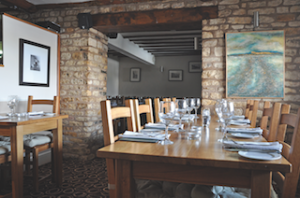 “Steaks have become our speciality and the beef is from Harker’s Farm Shop at Clipston, Notts, while our pork is from Redhill Farm, Gainsborough. We get free range eggs from Anthony Watchorn of Loodall Farm, Whissendine, and local farmers bring us game. “The other day a shooting party turned up at 5.30pm and begged to be let in in exchange for six pheasants. I let them in!” says Kristy. There’s also a large number of allotments opposite that provide fresh fruit and veg. The couple took on the Black Bull just as the credit crunch struck so have had to work tirelessly and be inventive to grow the business. Also, before their arrival the pub had been unloved for some time. They now run a pudding club – showing off Kristy’s homemade puds – on the last Friday of the month, and Kevin has invested in a 15-seater courtesy bus. If you’re a dining group of four or more within 10 miles of Market Overton, he’ll pick you up and drop you off – a great idea. There’s also a good old fashioned pub quiz every other Thursday. The Black Bull is a classic village pub that can be summed up in three words: comfort, warmth and puddings. Visit the Black Bull website.